There is a sweet history behind this recipe. It dates back to Feb, 2005 . One fine night when I walked into the kitchen there was nothing but a cup of curds and some methi leaves in the fridge. Potatoes are usually always there at home and I needed a curry that goes with rice. Thats how alu methi kadhi was created. 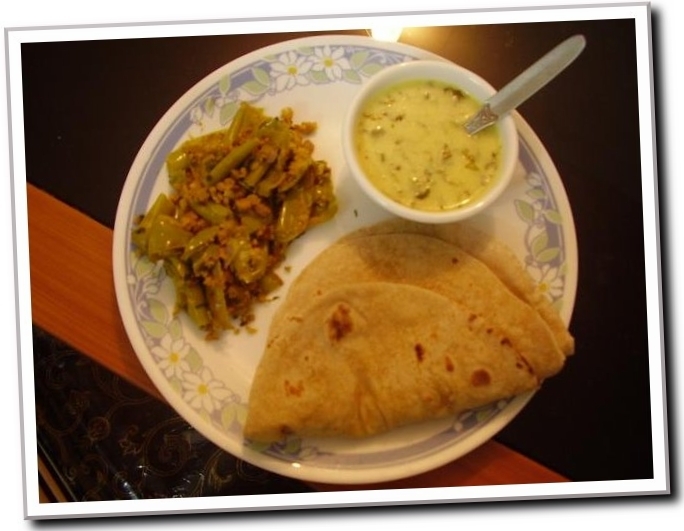 Now its my husband’s favorite dish and is made regularly at home. Boil Potatoes and chopped Methi leaves. You can microwave them in water for 10 minutes to speed up the process. Heat oil. Add rai, red chilly flakes, curry leaves and fry for a minute. Now add the curd mixture and let it boil till the raw smell of besan goes away. Strain the potatoes and methi leaves and mix them into the curry. Bring to boil. Once done, add vinegar and turn off the heat. Garnish with finely chopped Coriander leaves. Grind coconut, red chillies and raw rice in the blender with some water. Boil the pumpkin pieces in a vessel with 4 cups of water and haldi powder till the water quantity reduces to half. Once pumpkins are done add the coconut paste and continue to cook for 5 more minutes. Turn off the heat and let pumpkins cool. Add curds and stir well. Heat coconut oil and add rai, curry leaves for the tempering. Mix this into the pumpkin curry. Garnish with coriander leaves and serve hot with plain rice. Adding curds to the curry when its hot can make it split. In this curry, we don’t want that to happen. You can heat the curry once its completely done and serve hot with rice. This is a special dish made by Rajasthanis. The desert land has minimal supply of fresh fruits and vegetables leading to people finding other ways to prepare their curries. Ghatte ki sabzi is one such exotic invention of the Rajasthanis. It is a unique dish in which the dryness of the besan is complemented by the moisture in the yoghurt. This is truly one of my favorites! Keep 2 tablespoons of Besan aside. Knead remaining Besan into a stiff dough with salt, ghee, jeera, ajwain and some water. Grease a tray and spread out the dough on it. Grease the upper surface with ghee and carefully roll it up. Let it rest for a while. 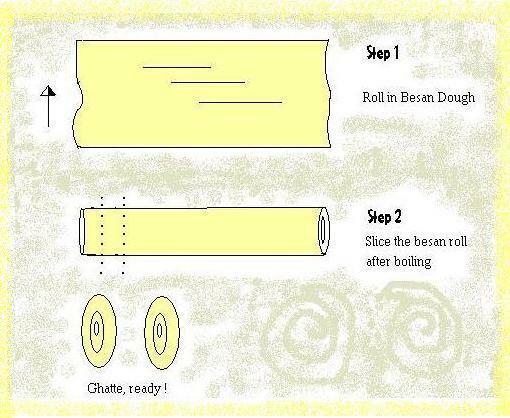 Place the besan rolls into boiling water for about 5-7 mins. Take out the rolls into a sieve and allow them to cool. Cut the roll into round pieces. These pieces are called Ghatte. Take curds separately in a bowl. Mix into it 2 tablespoons of besan, dhania powder, haldi powder and salt. Heat oil in a kadai. Add Rai, Hing and red chilly powder. To this tempering add the previously prepared Ghatte and fry for a short while. Now pour the curds mixture into the ghatte and cook for about 5-7 mins, till the Besan smells done. Garnish with dhania leaves and serve hot with rotis. Care needs to be taken while adding salt to the curds mixture as Ghatte already contain salt.